Book 1 of the Time-Travel Duo, Before Anne After: It’s July, 1987. 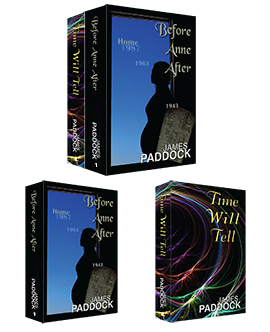 Through a series of small errors and oversights – a missed phone message, an unlocked high-security door, a lax in protocol, a falling purse – eight-month pregnant Annabelle Waring unknowingly stumbles into her husband’s time-travel experiment. She awakens in a 1943 Charleston Navy Shipyard barracks with no memory of the event. Her existence and her sanity become questionable; if not for her newborn baby and a Charleston, South Carolina police officer, she would certainly have checked herself into the funny farm. Her doctor, alias German spy, learns before she does that she is not only a time-traveler, but a highly educated woman in the field of nuclear science and World War II history. When she finally discovers her own secret, Anne must strive to get both her and her infant daughter home, even at the risk to her own life. Book 2 of the Time-Travel Duo, Time Will Tell: Annie seldom thought about her age, certainly never talked about that summer in 1943 when her mother birthed her, about the fact that her mother died that same year, or that it might have been in 1987–there was no way of knowing for sure–or about the fact that after 64 years she had yet to observe her 20th birthday. Already a Iraq War widow, Annie Caschetta must escape the oppressiveness around her and all the memories of her husband. With the semester over at MIT and the dreaded summer looming upon her, she chooses to escape to a cabin near Glacier National Park where she can sort through her thoughts and memories. However, it is her final, regrettable words during her last few moments with her husband that follow her and continue to haunt her. It is those words which she knows must be fixed, must be unsaid, if she is ever to have a real life again. If only she had a wormhole.